So what’s the story of Rockin’ola? Rockin’ola Granola was created for kids as an incredibly fun Allergen Friendly WHOLE GRAIN snack or breakfast cereal made of flavorful granola clusters! I admit I am a lifelong food and nutrition fanatic. Having spent most of my 30-year journey in the corporate world as a Food Industry Ingredient Specialist, I had many opportunities to offer clean, natural ingredient solutions to formulators nationwide. Many of the big corporations, though, were more interested in cost factors, the bottom line…even when it came to kids’ food products! The use of artificial flavors, colors, and preservatives continued. Enough! It was time to unleash my passion and entrepreneurial creativity…..so, by combining my experience as a Certified Food Scientist and education in Nutrition (Michigan State University – Go Green! ), I was determined to develop a clean label product, that was nutritious and delicious. With that in mind, my goal was to create an incredibly tasty product that kids would love AND be whole grain. Idea…what about awesome ‘kid’ flavors of healthy granola?? There were very few, if any out there! 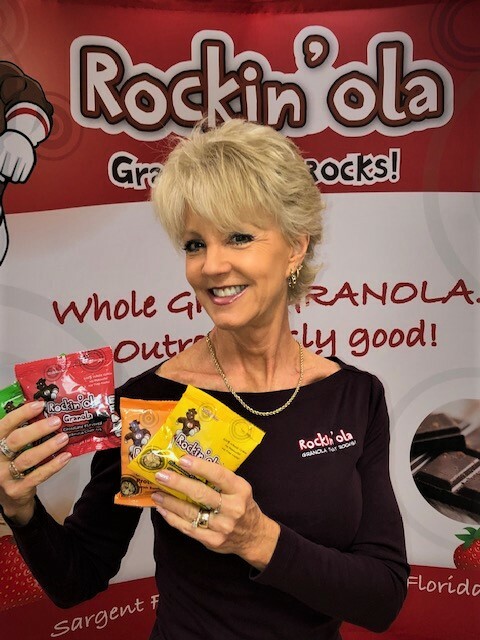 Well, in 2012, after a few prototypes and some student sampling with Charlotte County, Florida, Schools, Rockin’ola Granola was born – and we began to ROCK! Rockin’ola Granola is made from 100% whole grain Oats, Allergen-Friendly – NO Peanuts, NO Tree nuts, NO Wheat, NO Eggs, NO Dairy, NO Soy* (PRO Protein Granola does contain Soy Protein Isolate), and of course, is made with heart-healthy canola oil, NO HFCS, NO artificial flavors, colors, preservatives and contains no/low sodium. Healthy eating habits are important to establish early in life. Kids are typically exposed to many “not so nutritious” options for snacking, and it is essential to have wholesome healthful snack choices available that they will enjoy. Offering nutritious whole grain products in school is a great way to introduce these healthy options. Today, Rockin’ola Granola is served in schools nationwide, and kids LOVE it! And, yes, Rockin’ola meets/exceeds the School Nutrition Requirements. Our products also comply with “Smart Snacks in School” ruling, HUSSC and Alliance for a Healthier Generation Competitive Foods Guidelines. Rockin’ola Granola was tested, and APPROVED, by students. And, even though Rockin’ola was developed originally for kids, adults are crazy about it, too! WBENC’s national standard of certification implemented by the Women’s Business Development Center — Florida Certification Committee is a meticulous process including an in-depth review of the business and site inspection. The certification process is designed to confirm the business is at least 51% owned, operated and controlled by a woman or women.